This morning I have learned three new things! 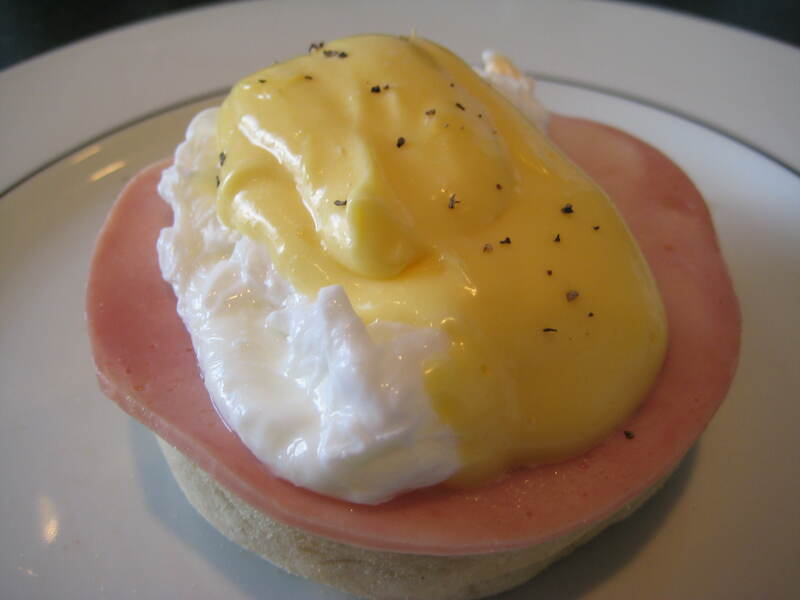 How to poach eggs (can’t believe I haven’t done that before), clarify butter and whisk hollandaise away from the heat. It all turned out rather well, thanks to the great guidance from the book Breakfast at the Wolseley, that I got for my birthday. The Wolseley is a great restaurant, which I haven’t yet written about, even though it is one of my favourite places in the whole world. I promise to tell you about it soon! The Wolseley is the kind of restaurant where you could eat every meal in. Their breakfasts are superb, they’re fully booked for lunch and dinner, and you can pop in for afternoon tea or a light bite at any time of the day. 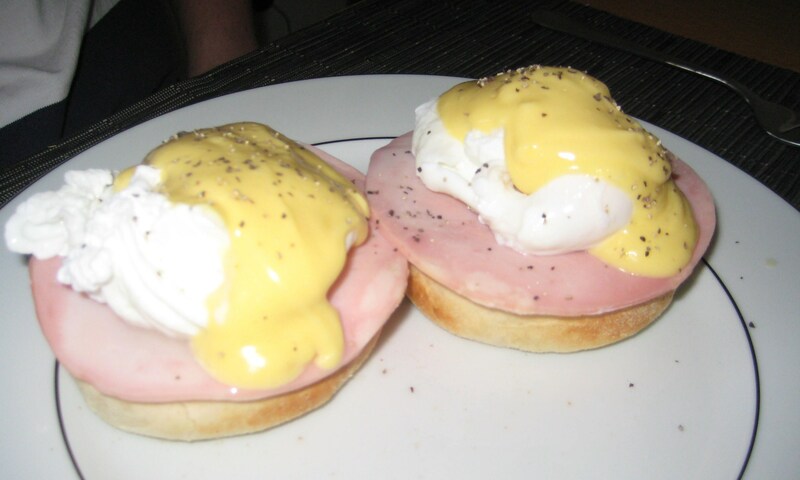 The book is also amazing, so of course I had to try their recipe for my favourite breakfast – Eggs Benedict. It is not the easiest, quickest breakfast you can make, but it is worth the extra effort. Eggs Benedict are for those days without an agenda, the lazy Sunday mornings that suddenly continues into the afternoon without you realising how much time has passed. Start by making the sauce: put the vinegar, shallots and peppercorns in a pan and boil until it is reduced by two-thirds. Strain the reduction into a glass bowl. Clarify the butter by melting it in another pan over low heat. Skim the surface until only clear liquid remains. Remove from the heat and let it cool, then carefully pour the butter into a clean bowl, leaving the residue in the pan. Place a glass bowl over a pan of simmering water. Add the yolks and vinegar reduction and beat with a wire-whisk until it smooth, thick and pale. Remove from the heat and whisk vigorously adding the butter little by little. Season with salt and lemon juice. Poach the eggs by simmer water in a large pan, pour in 1-2 spoonfuls of vinegar, this will make the egg form a tight shape in the water. Crack the eggs into cups or mugs and lower them into the water, if you’re only poaching 1-2 at the time, you can swirl the water around to help shape the eggs. Put the lid onto the pan, and leave for three minutes. Then lift the eggs out with a perforated spoon and into a bowl of cold water to stop the cooking. 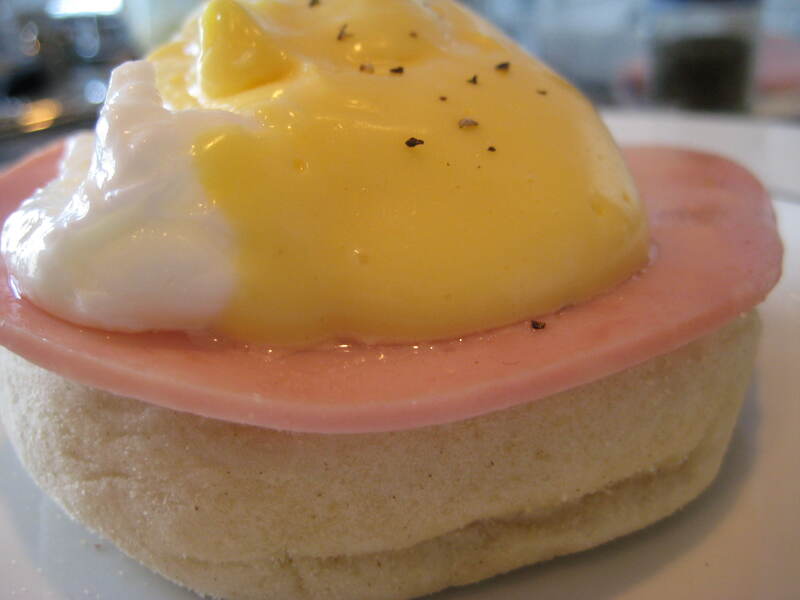 Toast the muffins while the eggs are poaching, spread with butter, place the ham on top and put them on plates. Make a little imprint in the middle of the muffin, for the egg to lie, drain the eggs and put them onto the imprints, spoon the hollandaise over the eggs and sprinkle cayenne pepper and chopped chives over the it (black pepper will do too).